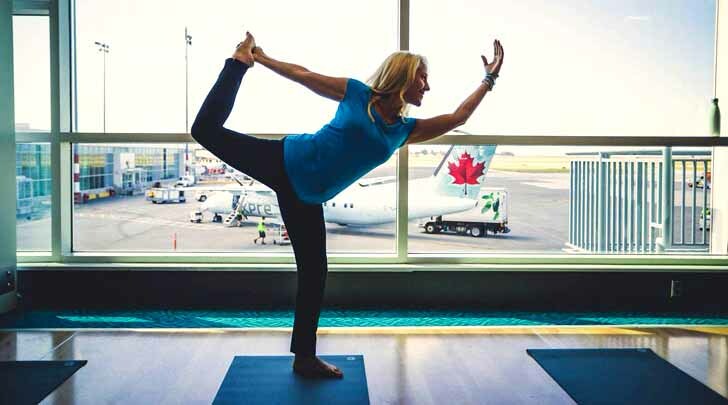 Nevada : Hindus are critical of the new trend where travelers have to pay a fee to access yoga space or session, which is part of the privately owned airport gyms or living-rooms. Distinguished Hindu statesman Rajan Zed, in a statement in Nevada today, said that these airport gyms and living-rooms were fine; but all the world airports should also provide space for multi-benefit yoga for the passengers without any charge if they were serious to help reduce their stress levels and deliver the “world-class passenger experience”. Zed, who is President of Universal Society of Hinduism, pointed out that many world and US airports had been offering yoga facilities for free for quite some time, which was widely welcomed by the travelers, and should continue. Rajan Zed noted that although introduced and nourished by Hinduism, yoga was a world heritage and liberation powerhouse to be utilized by all and charging fee for it at a public facility did not seem right. It would be step in the positive direction if all airports provided a yoga-room to be used by all passengers, staff and visitors for free. Zed further said that yoga, referred as “a living fossil” whose traces went back to around 2,000 BCE to Indus Valley civilization, was a mental and physical discipline for everybody to share and benefit from. According to Patanjali who codified it in Yoga Sutra, yoga was a methodical effort to attain perfection, through the control of the different elements of human nature, physical and psychical, Zed indicated.